1) When you are preparing the foods for a meal, look at a particular category of the foods and select more foods in the alkaline category. 2) This alkaline food chart is only accurate for certain state of the foods. For example, cooked lettuce has a different pH value compared to a boiled lettuce. 3) The food chart is based on a number of acid alkaline food chart, nutritionists, and doctors. If you find a conflict with other alkaline food charts, sign up for our newsletters you’ll discover the alkaline principles behind these differences. 4) This alkaline food chart is based on the “residue” or “ash” of the foods after it has been digested in the stomach. That is why you will find lemon is categorized under alkaline and not acidic. 5) Bookmark this page and come back to this page whenever you need. Share this page with your friends in Facebook or where you go if you think your friends would love this chart too. If you like a printable version, scroll down to the bottom of the page and there’s a link for you to download the printable version of the chart. Feel free to share this acid alkaline list with your friends and family and help to protect their health. Take a look at how your blood will look like when your body is alkaline – Acidic vs Alkaline Blood! To download printable version, right click the link below and click “Save As” to download the chart. My understanding about this is that at least one other factor has to be taken into consideration (and not mentioned here) – not all acidic foods behave acidic in the body. Examples of that are limes and lemons. It’s also why I ingest ACV (apple cider vinegar) every day. It behaves alkaline once ingested. You might have to dig deeper on this site to find that out, but just Bing it and you’ll see. Simply having a list of foods doesn’t tell the whole story, so don’t just reply on the list provided here. The way in which bodies and foods interact isn’t quite that simple (don’t we wish!). As stated, if only things were so simple. First off if you check a number of charts you will notice that the PH of some foods are quite diverse. Also, if a food is cooked it will make it more acidic. Its PH will also depend on the soil it was grow in, how ripe it is, the climate it grew under, etc. When you refer to a lemon as being acidic, you are talking about its raw form. When you talk about the PH of a lemon, you are talking about what remains after digestion, known as ash, which is highly alkaline. Blueberry and goji berry plants grow in acidic soil and their fruits are USUALLY listed as being acidic. However, they have very high anti-oxidants which are extremely beneficial for neutralizing an acidic condition. Both berries are used with great success for treating acidic conditions, while most foods that are alkaline will prove less beneficial. You could also use Aloe Vera as well as many others. You can get excellent result by rebalancing an acidic condition, but you need to realize that you are only treating the symptom, and not the true cause of the PH imbalance. I SEE CHOCOLATE IS NOT MENTIONED WHY? Thank you so much–much needed information! 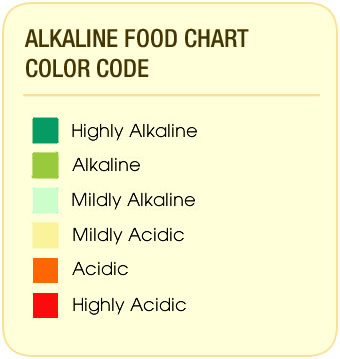 Your Acidic/Alkaline list is very informative and will be put to good use. Thank you for sharing, it is appreciated. Thanks for the important information. You left out my favorite vegetable: eggplant. Acidic or alkaline? Tomatoes? I basically all but quit eating them years ago because I felt they were responsible for my arthritis symptoms. I had gout about 20 years ago, but never since, until recently. I started eating my homegrown cherry tomatoes like crazy and my gout returned, hell strength. I quit the tomatoes and have been taking a gout med and it is slowly getting back to normal after several weeks. Seems to me tomatoes are extremely acidic. Am I wrong about all of this? this heaven sent, can’t thank you enough, gonna try all the good food’s that’s better for me , it’s sad when you don’t know what to put in your diet, thank you bjp. rEALLY APPRECIATE CHARTS AND ALL INFORMATION. How can I get a printed chart. I do not have a printer.. Appreciate your reading my mail. Excellent and very helpful chart . This will now impact my diet. I will certainly share with friends and family. Recently had surgery and could feel that my body had been poisoned. Now I understand why. I think the medication and anesthetics cause high levels of acidic in the body. Then my knee (torn) meniscus occurred. Do you think it is the acidic condition. I think so. Your information will be very helpful to clean up my system. This chart is very informative. I am dealing with cancer right now and I need more alkaline..